Natural drugs have become a subject of world importance with both therapeutic and economic implications. Natural products are harnessed as potential therapeutic candidates from natural resources for the discovery of lead drug candidates and new pharmaceutical products. The natural products provide most of the FDA approved formulations. Thus, they are the continuous source of inspiration in the development of new drug candidates. Naturally derived products have the significant role to treat life-threatening conditions. Information collected from various database sources such as Pubmed, Scopus, ScienceDirect, Google Scholar etc. has revealed that biologically important scaffold and molecules are abundantly naturally available. Hence, the information is compiled as a short review on some highly valuable natural resources as anti-infective agents. Moreover, a special emphasis has also been laid on the marine anti-infective agents. This compilation will pave way for scientific, academic and industrial researchers to look forward to discover high valued anti-infective agents. 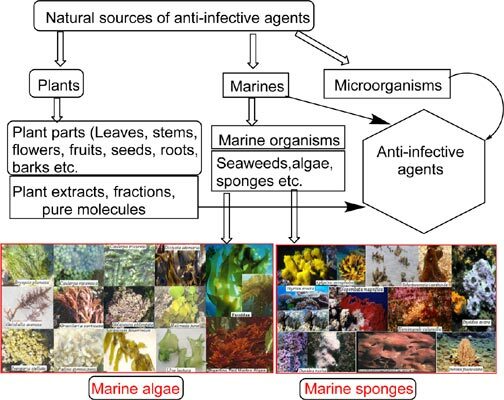 Keywords: Natural product, drugs, anti-infective agent, marine sources, sponges, infectious diseases. Keywords:Natural product, drugs, anti-infective agent, marine sources, sponges, infectious diseases. Abstract:Natural drugs have become a subject of world importance with both therapeutic and economic implications. Natural products are harnessed as potential therapeutic candidates from natural resources for the discovery of lead drug candidates and new pharmaceutical products. The natural products provide most of the FDA approved formulations. Thus, they are the continuous source of inspiration in the development of new drug candidates. Naturally derived products have the significant role to treat life-threatening conditions. Information collected from various database sources such as Pubmed, Scopus, ScienceDirect, Google Scholar etc. has revealed that biologically important scaffold and molecules are abundantly naturally available. Hence, the information is compiled as a short review on some highly valuable natural resources as anti-infective agents. Moreover, a special emphasis has also been laid on the marine anti-infective agents. This compilation will pave way for scientific, academic and industrial researchers to look forward to discover high valued anti-infective agents.